The C Star vessel run by a group of anti-immigration activists is seen north of the Libyan coast in Western Mediterranean Sea. The owners of a controversial anti-migrant ship have lashed out at Malta after they were denied any cooperation by the local authorities. In a statement which followed a series of tweets throughout the afternoon, the Defend Europe group dubbed the Maltese government's decision to deny the ship cooperation or supplies "a historic disgrace". "The government of Malta is betraying their national history by supporting human trafficking and obeying international migration supporters," the right-wing group, which professes to be on a mission to "defend Europe against illegal immigration", said. In an earlier tweet, the group wrote that they had been denied fresh water by Maltese authorities. Their ship, C-Star, has been embroiled in controversy for weeks, as it tries to block the rescue of refugees from the Mediterranean Sea, which it described as part of an “invasion” endangering the continent. Times of Malta is informed that the ship owners asked for "services" through an agent in Malta but their request was denied. At one point they also requested that a member on board be brought to Malta to leave for France, a request which was also denied. "The ship is not welcome to our shores because of all that it stands for," a government spokesman told Times of Malta. The spokesman made it clear that the vessel, which is still berthed outside Malta's territorial waters, never made an official request to berth in Valletta. "This was not a case of an emergency," he added. The government's stance was commended by a group of Maltese NGOs, who in a joint statement said Defend Europe's political ideology was "dangerous and extreme" and should not be underestimated. "The stance adopted by the Government of Malta sends out a clear message against the politics of hate and extremism," the statement read. The statement was signed by aditus foundation, Graffiti, Integra Foundation, Jesuit Refugee Service (Malta), Kopin and the Critical Institute. 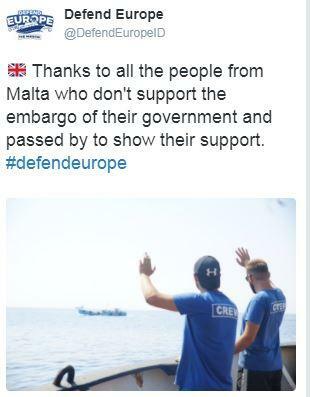 According to Defend Europe, not all locals agreed with the government's stance, with the right-wing group also sending out a tweet to thank those who had "passed by to show their support." In its statement, the group said "dozens of small boats with Maltese citizens" had approached the C-Star in support today. 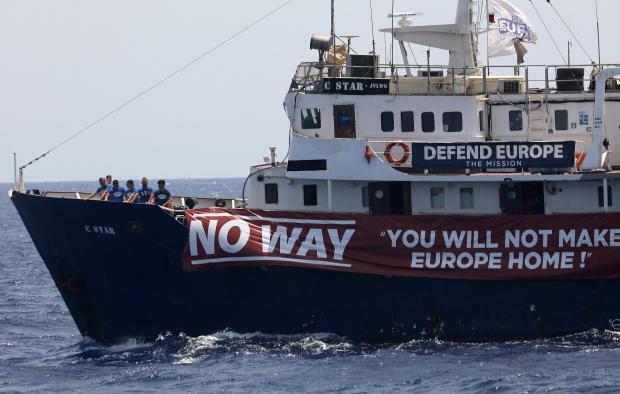 Defend Europe's reference to NGO vessels using Malta as a base refers to the Migrant Offshore Aid Station, which has saved thousands of migrants in the Mediterranean in the last two years. The C-Star was described at the European Parliament as the “ship of hate”. Last July, Italians called on their Minister for Transport to stop the ship from docking in Catania, preventing it from setting sail. Defend Europe has said that it will move on to another port tomorrow "in France or Croatia."